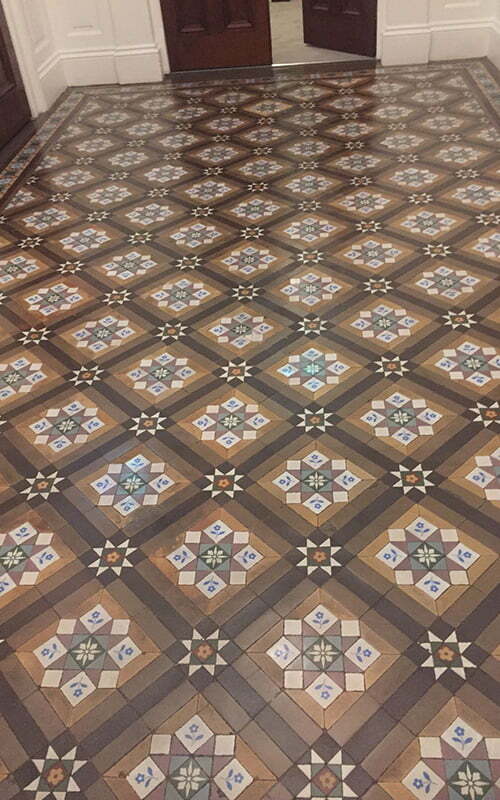 We recently restored a beautiful, 18th Century encaustic tiled floor on Merrion Square, Dublin. The majestic square is lined with elegant and ornate Georgian town houses, with of course Leinster House on one side. The square was laid out in 1762 and completed just at the beginning of the 19th Century. The building of the square came about after the Duke of Leinster built his Dublin home on the then undeveloped south side of City (now Leinster House). Development of the south side of the city was fuelled by this brave move and Merrion Square was thus developed, followed by St Stephen’s Green and Fitzwilliam Square. This may well be where the Northside/Southside divide came about, as aristocrats started selling their Northside properties and migrated to the new and more opulent Southside town houses. The town houses were mainly used as city residences for aristocrats who conducted their business in the city. Of course they would have had even more splendid residences in the country. Interestingly, the living quarters tended to be on the upper floors to escape the smells from the city streets below. Merrion Square was still very much a residential area up until the 1950s, when the cost of maintaining these 250 year old buildings were offset against nice new residences in suburbia. The square gradually became a more commercial area with most buildings now being used for office space. The inside of these townhouses have some of the most ornate and beautiful decorative plaster work, fireplaces and stone and tiled floors the Georgian era has to offer. However, they were largely covered up or just taken for granted during the latter half of the 20th Century. Now, thankfully, there is a great interest in stripping back these town houses and restoring their Georgian features wherever possible. Recently, a lot of these buildings have been restored and brought up to date as useful and contemporary office spaces. In recent times we have noticed a surge in demand for our services to restore these beautiful buildings and give them a new lease of life for generations to come! Our latest project on the square was at the head office of Scott Tallon Walker at 20/21 Merrion Square. They were refurbishing the two adjacent buildings, creating a new work space while preserving the heritage features. 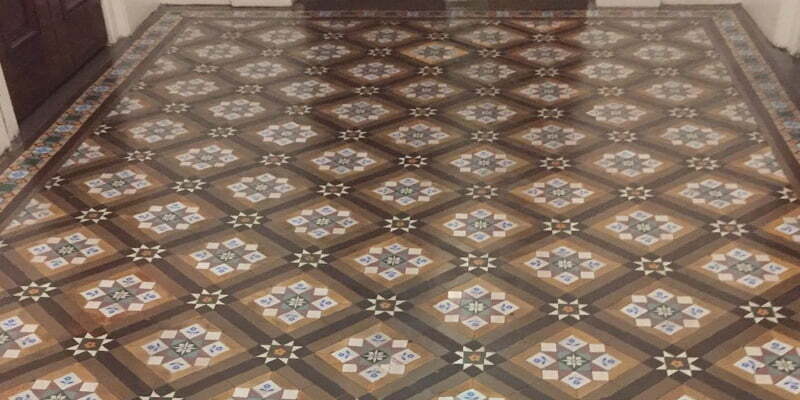 We were called upon to restore the stone entrance floors. 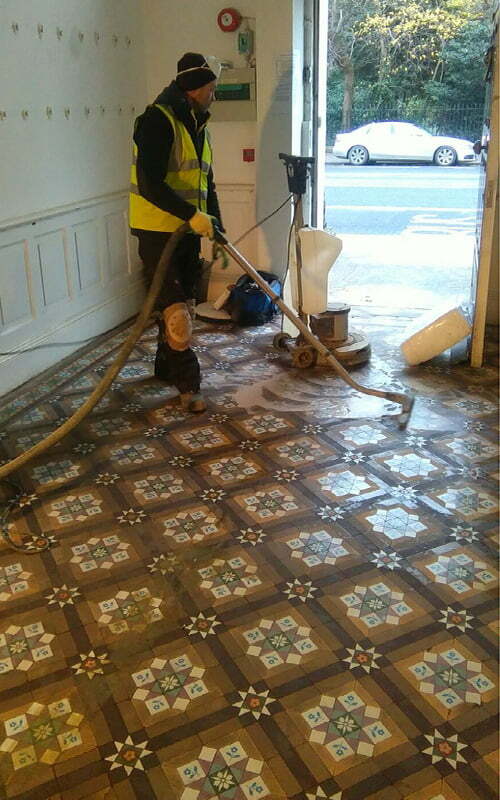 A carpet was lifted at number 20 to reveal an encaustic tiled floor. The floor was covered in levelling compound, glue from various coverings placed on the floor over the years, a build up of previous coatings and traffic build up. Our initial task was to strip back the floor to reveal what we were dealing with. The encaustic tile floor most probably dated back to when the house was built in the late 1700s and in fairness was in pretty good condition. Our biggest challenge was the very broken and damaged tiles in the heavy traffic areas, particularly at the door entrances. 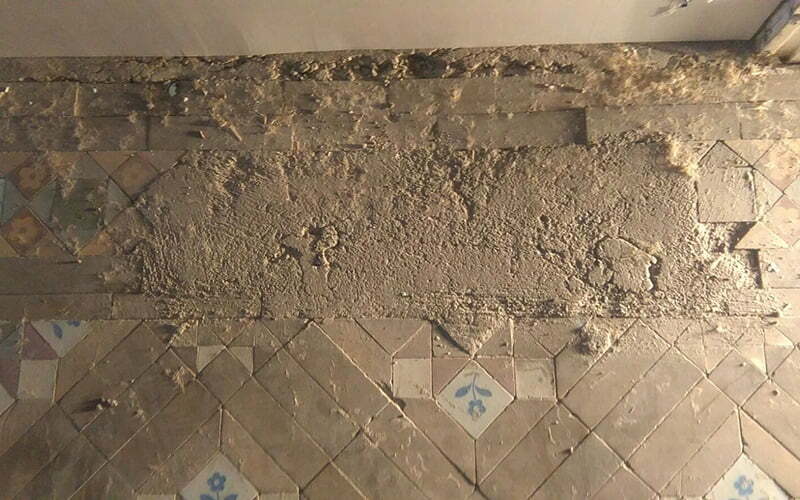 We attempted to source replacement tiles from salvage outlets but were unable to source a good match in time to meet the contractor’s deadline. 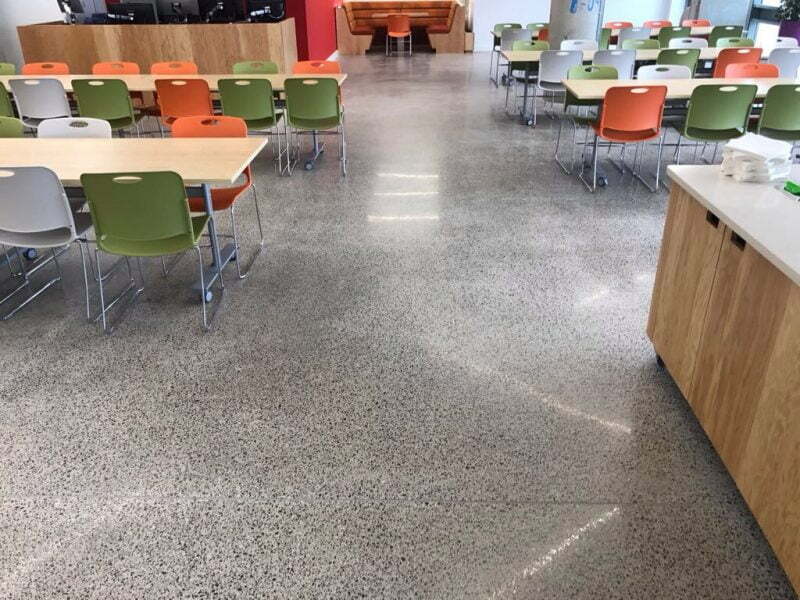 We then suggested we lift good tiles from low traffic areas – around corners and where the Reception desk was going to go – and re-lay them in the heavy trafficked areas. 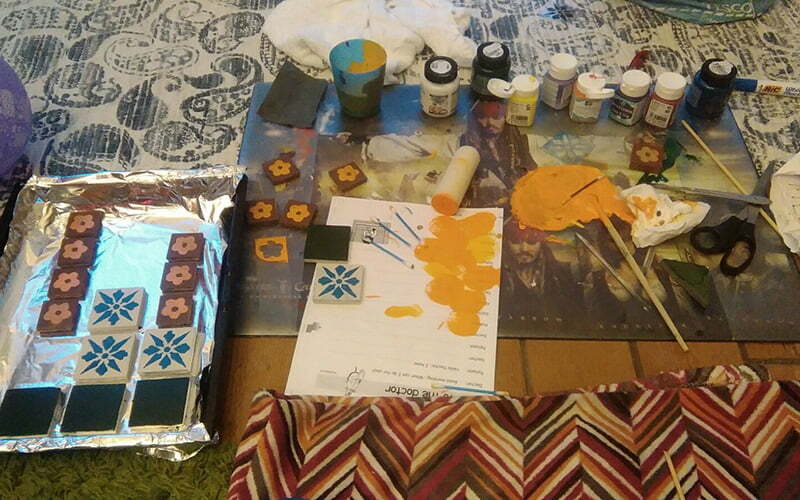 We then proceeded to make our own replacement tiles and match them as best we could to the originals. 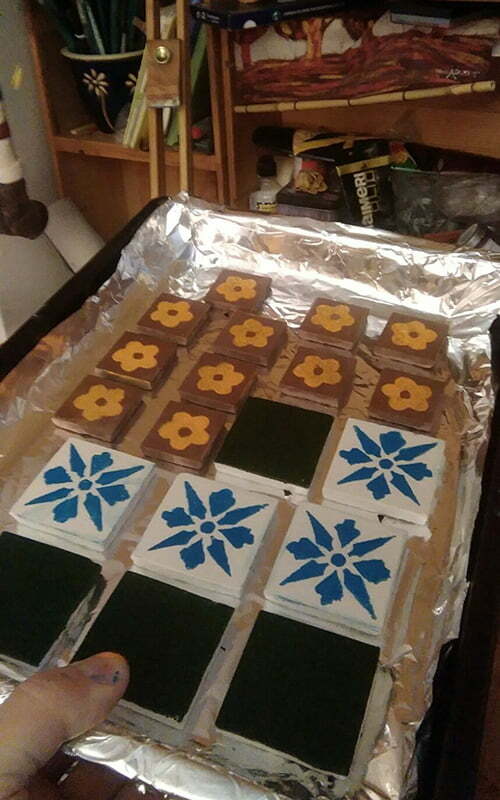 Each replacement tile was hand painted by our very enthusiastic restoration craftsman, Michael, and aged and glazed to replicate the existing tiles. These were then re-laid in the low traffic areas. The floor was beginning to look really good, however there were a lot of lose tiles throughout the hallway. 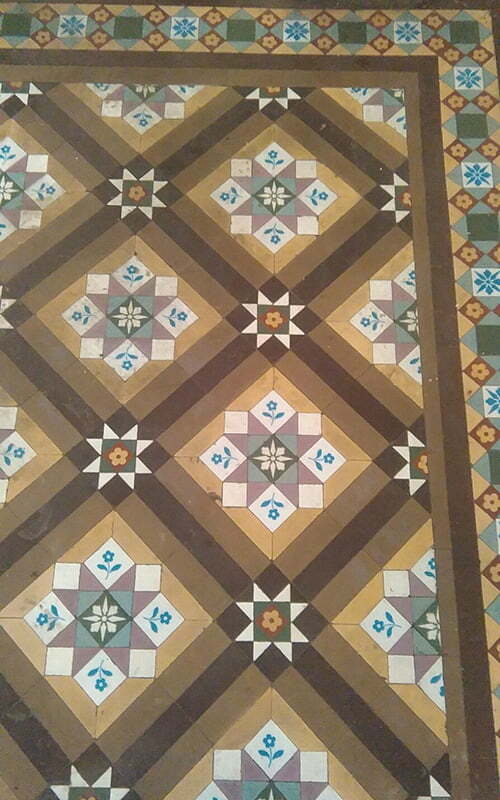 We carried out tests for lose tiles and lifted those, ensuring we did not compromise the surrounding tiles. 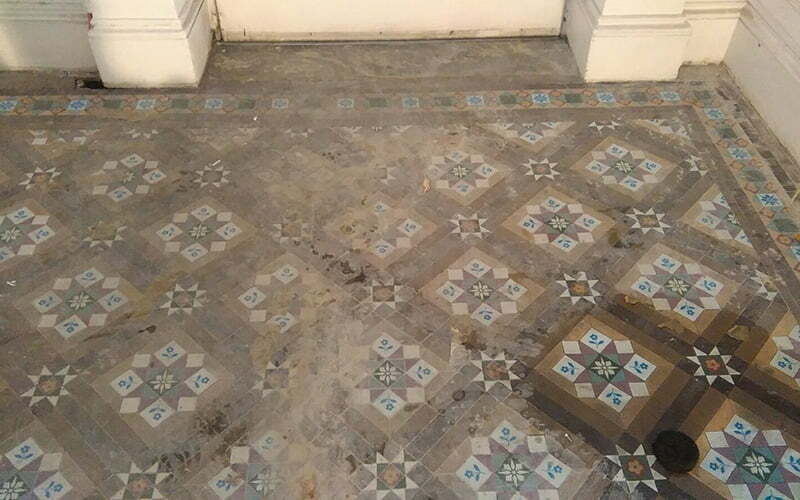 Lose tiles were then re-laid and re-grouted. 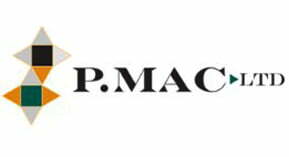 Once all restoration works were complete we carried out a non-invasive final clean and handed over a maintenance programme to the client. 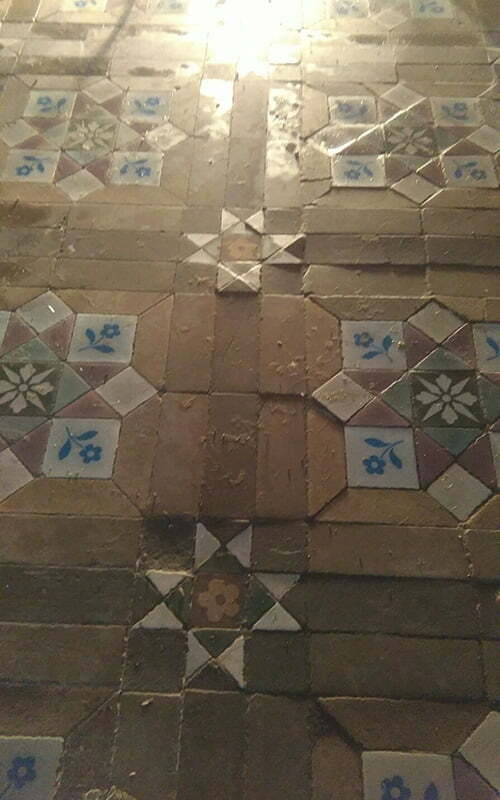 This will help to help ensure this 250 year old tiled floor will serve its purpose as a decorative and resilient floor for years to come. It is also wonderful that we played our part in preserving some of the heritage of Merrion Square. 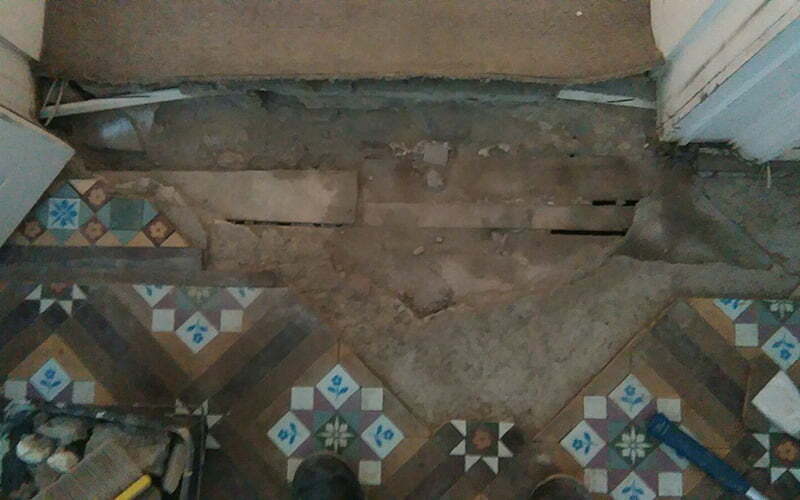 Next door, at number 21, a quarry tile floor was discovered in the entrance. However, the client did not want to restore this floor as it wasn’t fit for purpose and chose instead to replace it with a Portland stone floor. The client had a specific stone in mind and we sourced the exact match from TileStyle. A lot of preparation work had to be carried out before the floor could be re-laid. The entire floor was stripped and taken back to the wooden joists in the sub floor. The floor was then re-levelled to take the new Portland stone floor. This was a challenge, as the three doorways in the hallway were all at different levels. We laid an isolation mat under the stone to allow the stone to move if there is movement in the sub floor. Sub floor movement is the major cause of tiles breaking and grout becoming lose on tiled floors. 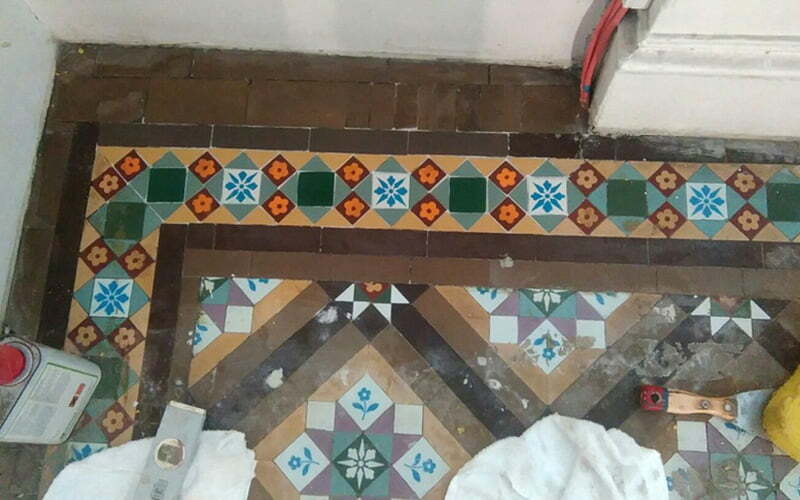 We gently cleaned the tiles and gave them a light re-hone which had the double benefit of closing the pores of the stone – to help with maintenance – and also gave the stone an older, used look that blended perfectly with the rest of the building. The floor was then sealed with a penetrating seal, which will help prevent spills seeping into the stone and again a maintenance plan was given to the client.